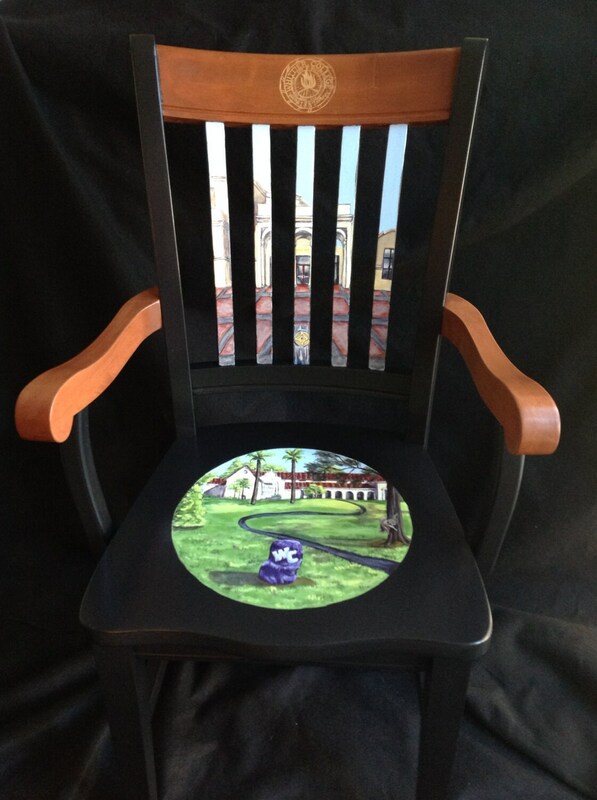 Call them college chairs, recognition chairs, insignia chairs, alumni chairs...my unique take on this traditional concept was originally conceived for Whittier College in California, to present to members of their distinguished circle of donors, their Poets Laureate. Philanthropists, civic leaders, alumni...the college wanted to thank them for their generosity, in a very personal way. And now this unique concept is available to you, your school, or your organization! For your institution or event, I will create a unique, completely customized design to produce a truly one of a kind commemorative treasure. The chairs you see pictured depict the life story each recipient as it intersects with the college. 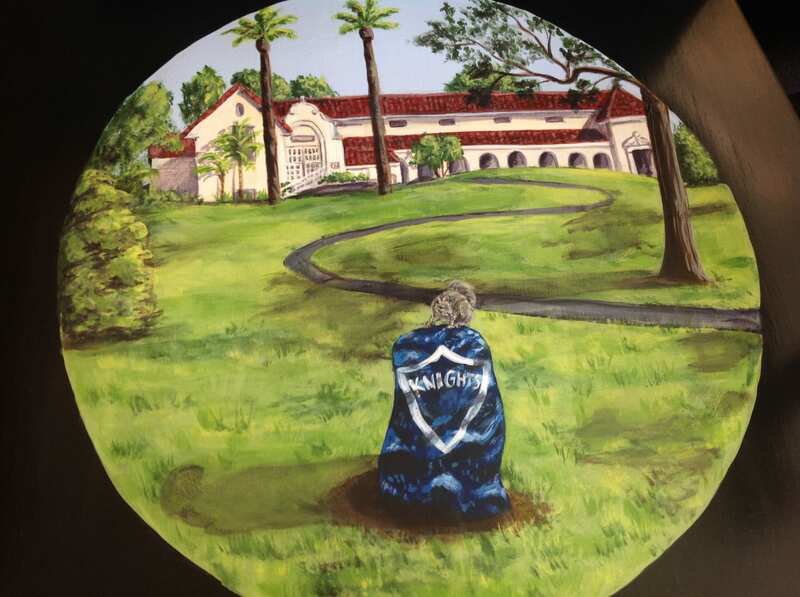 In order to tell that story for Whittier College, I learned quite a bit about their history to present an iconic image on the seat: the hallowed Diehl Hall nestled in the lush, park-like setting of the college. In the foreground is the Rock, a 101 year old piece of history that the students' societies (like fraternities and sororities) vie to paint in their signature colors--and each time, I depict the Rock in the colors of that recipient's society! Another bit of college lore, Friday the squirrel, pops up unexpectedly somewhere in the scene. The original Friday was the pet of the school's founder--and is said to be stuffed and lurking somewhere in the library...my version is a bit livelier! What story can I tell for you? 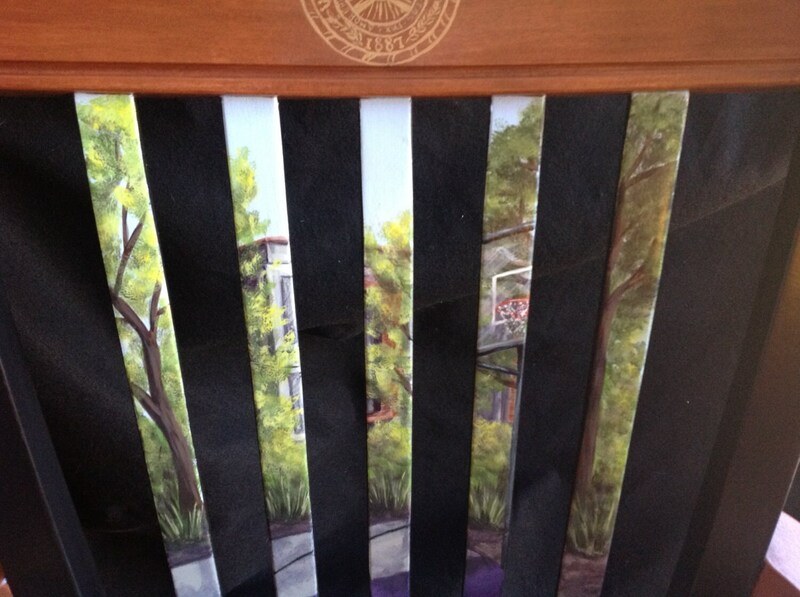 The chair back is where I carefully build scenes that reflect more personal elements, specific to each donor. Details from their lives, careers, subjects of particular interest, specific gifts to the college...each donor will find a treasure trove of hidden references that will be uniquely meaningful to them, whether it's basketball courts, a love of air crafts, or chocolate chip cookies! The back consists of five slats, each 1 inch wide, so this story is told in small sections of minute detail, leaving your eyes and brain to fill in the negative space in between. 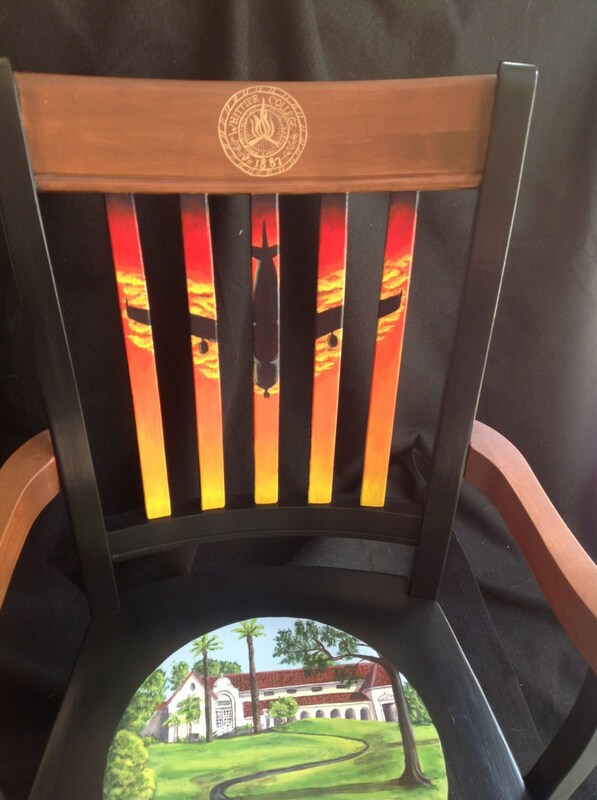 Each chair is then finished off with a hand painted artistic rendering of the college seal in gold leaf paint, and a hand-lettered legend reading "Poets Laureate." Each chair is made of solid alder wood by Whittier Wood (a happy, unexpected naming coincidence), and I hand paint, stain, and seal each one using all non toxic acrylic paints and sealers. Dimensions are 21 1/2” (width) x 38 1/2” (height). Given the customized nature of each piece, please allow 12 weeks for completion. Contact me, and let's start telling your story! Shipping cost listed is an ESTIMATE ONLY. Please contact me for a quote to your location. I will work with you to find the best method and rates. This item only ships assembled. Shipping costs vary by location and item, and a variety of shipping methods are available. For a quote, please send me a conversation with your zip code and the item in which you are interested. Due to the customized nature of the product, all sales are final. In the event that a piece has a defect that is deemed to be within the purview of Lara Eve Designs and outside of the listed restrictions, a replacement, repair or refund will be issued at the discretion of Lara Eve Designs provided you contact me within 10 days of receipt of the item. Please contact me for additional details for custom pieces, additional charges may apply. Lara Eve Designs is not responsible for subjective interpretations of art. Lara Eve Designs agrees to deliver an intact product, free from major defect. Wood furniture pieces vary widely even within model groups, and variances in grain, coloring, and other cosmetic differences are not considered defects. In the course of normal use, wooden furniture of any kind will incur incidental damage. This is considered normal within the life of the product. Lara Eve Designs is not responsible for wear and tear or other damage after purchase. 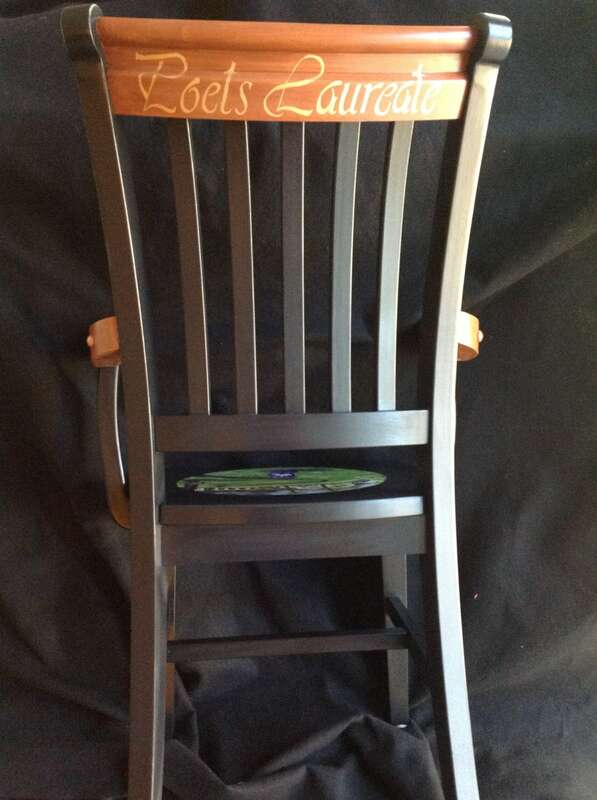 Lara Eve Designs does not manufacture the unfinished wood products used. Lara Eve Designs may be required to assemble products prior to application of original artwork. Before assembly or application of any artwork, Lara Eve Designs will inspect all products for obvious visual and physical defects. Any unfinished product found to be defective or possessing visual defects that will interfere with the overall artistic vision of the finished product will be returned to the manufacturer and not be used as an artistic canvas. The assembly and finish work provided by Lara Eve Designs should in no way void or invalidate the manufactures warranty or responsibility. Manufacture’s information will be provided if requested. By completing the transaction, you the purchaser agree to the above.